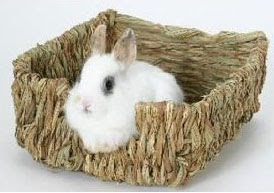 Peter's woven grass pet bed is the ultimate in natural grass cage accessories, that protects your pets sensititve paws from wire cage bottoms and is safe to chew. Try using it as a natural bowl to contain your peter's Timothy Hay or meadow mix forage hay. Buy here.